Puerto Vallarta on Mexico’s Pacific coast is a resort town famous for its gorgeous beaches, great hotels, and nightlife. It's been a popular sun seeker destination since the 1960s but was first "discovered" by American artists and writers in search of a bucolic and balmy setting. Today it attracts Mexican, American and international travelers who come for the perfect weather (average daily high temperature is 86 °F, and the average daily low temperature is 70 °FC), water sports and beach lounging. Travelers can choose from several luxury resorts, among them the highly rated Hyatt Ziva Puerto Vallarta with its private, sandy beach featuring gentle surf and spectacular ocean views. The Hyatt hotel group set high standards from the very beginning when none other than business tycoon Jay Pritzker purchased the Hyatt House motel near Los Angeles In 1957. Yes, that's Mr. Pritzker of the famous Pritzker architecture award, the "Nobel prize" in architecture. When he unveiled his first hotel in Atlanta, featuring groundbreaking design and its now-famous atrium, he changed the hotel game, setting new standards for hospitality innovation. The Hyatt Ziva Puerto Vallarta is no exception. Hyatt first announced its foray into all-inclusive properties in November 2013. This location opened in 2014. What Is Hyatt Ziva Puerto Vallarta? Why Stay at Hyatt Ziva Puerto Vallarta? 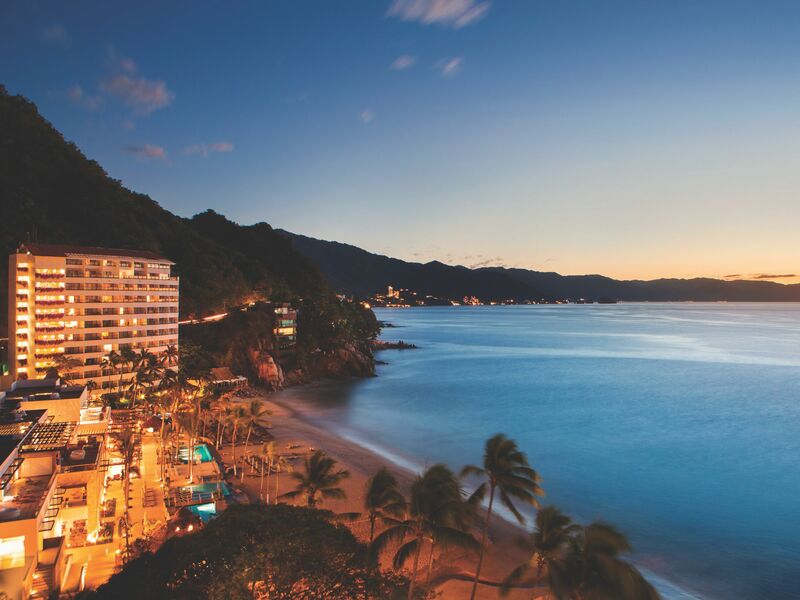 This all-inclusive Hyatt hotel is located in Puerto Vallarta, nestled at its own sandy private beach --- Las Estacas --- with gentle waves, with the beautiful backdrop of the Sierra Madre mountain range and ocean sounds. It sits on the more mellow south side of town in Conchas Chinas. There are more than 300 luxurious rooms and suites with stunning ocean views, white marble bathrooms, beverage centers, large HDTVs, complimentary Wi-Fi, beverage centers and designer details for perfect relaxation in elegant environs. Some suites have rainfall showers or hydro-massage bathtubs. Luxurious amenities include eleven standout restaurants, lounges, and bars; a spa offering relaxing palapa massages and hydrotherapy pools; seven picturesque pools and an infinity hot tub; a state-of-the-art oceanfront fitness center; yoga room; 24-hour in-suite dining; a tequila sommelier and tequila tastings; tennis court and KidZ Club. Seasonal activities include whale watching. 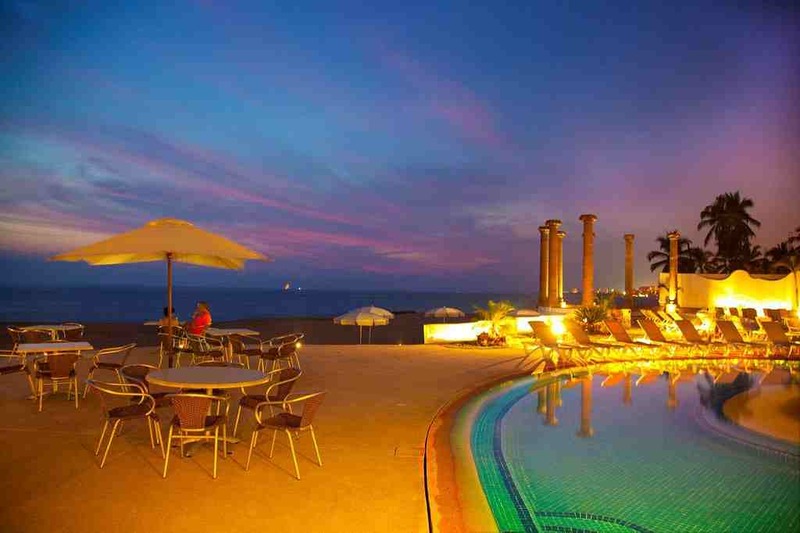 It's situated just 30 minutes from Puerto Vallarta International Airport. If you're looking for a romantic getaway a deluxe break, or a family-friendly beach and pool vacation, the Hyatt Ziva Puerto Vallarta excels. For couples or solo travelers seeking a pampering and relaxation, there are the shaded beach cabanas for lazing by the water; signature drinks, as well as tequila tastings, a luxe spa and several cocktail bars. Families with young children in tow will find family-friendly pools, plenty of dining options at restaurants with selections for tiny palates and the convenience of all-inclusive eating, drinking and playing, not to mention KidZ Club, where youngsters can partake in creative activities like arts and crafts, indoor and outdoor games, and cultural discoveries, like our seasonal turtle release program. There's also a splash zone with a grounded water fountain and mini pool, plus family movies and games on two televisions. The staff is amicable and courteous, taking care of your needs in the most friendly, welcoming and efficient manner. Cuisine plays a huge role here. Culinary adventures range from traditional Mexican offerings at the antique hacienda-style Casa Grande (It even has an interactive taco station) to Southeast Asian fusion fare at Pureza, such as its signature famous Singapore Sling, Octopus Skewers and Korean Baby Back Ribs bathed in Tamarind sauce. At BlaZe a romantic deck dinner with a view awaits. You might even spot dolphins or whales frolicking in waves. At contemporary Italian MelanZane luxurious dishes such as firewood oven-baked lasagna, cream of roasted tomato soup and cream of butternut squash with gorgonzola cheese, and let the savvy sommelier guide your wine choice. There are several themed bars and a Deli where you can grab a cup of freshly ground coffee and entertain yourself with computers and books --- round out the culinary options. Stressed out and need a balancing boost of wellness? VitaMar Spa connects you with the renewing power of nature and traditional Mexican customs and ingredients such as coconut, agave, and chocolate. The Blue Agave Ritual for Two is a luxurious journey starting with a full-body exfoliation via the agave leaf, sloughing off dead cells naturally. This will prepare you for the antioxidant-rich ancestral herb mask, and a complete Swedish aromatherapy massage to help you unwind, de-stress, and experience a profound sense of wellness. Meanwhile, the Chocolate Fondue Body Wrap & Manicure & Pedicure Fondue Wrap enlists the healing power of cacao to relax and rejuvenate you at once. Or enjoy a soothing Sea Breeze Aroma Massage in a palapa or indulge in oceanfront hydrotherapy. You can also find the luxury of inner peace via yoga classes at their beautiful movement studio. Of course, you can book facials, manis, pedis and more. There's nothing quite like taking a refreshing dip in the pool and then swimming right up to the bar to sip a minty mojito or classic margarita, amid vistas of azure waters stretching from the pool all the way to the beach. It's a luxurious and decadent way to while away some well-earned vacation time. Yes, you are reading correctly. You can (if 18 or older) book an exclusive, adults-only swim-up suite with direct access to a semi-private pool right from your terrace. This accommodation features your own lounge chairs, rainfall showers, In-suite beer, soft drinks and snack, designer toiletries, bathrobes and slippers, and more. It sleeps three guests. You can also opt for the Club Ocean Front Hot Tub Double, a serene room with two double-sized beds and a sofa bed, plus access to your own VIP in-suite refreshment center, a generous balcony and the pièce de résistance: a private hot tub with magnificent views of the Pacific Ocean. Sure, you can laze by the pool or beach all day and maybe sip a cocktail and then relax some more. But the Hyatt Ziva Puerto Vallarta offers a plethora of unique activities to keep you entertained and active around the clock. You can book jungle tours and river hikes, embark on kayak tours or go whale watching. There are sightseeing excursions and eco trips. On the premises, you are treated to tropical dance lessons, Spanish lessons, cooking or cocktail demonstrations to immerse yourself in the spirit of Mexico. Beach activities include volleyball, soccer and tournament style horseshoes, as well as ping pong, corn hole, and board games in the resort’s activity center. And don't forget the Tequila Bar! Nighttime entertainment ranges from acrobatic fire shows and Mexican folklore performances to mimes and circus shows. A signature treat is the Hyatt's Water Light Show, a mesmerizing melange of circus and acrobatic acts. There's also a Cruise Ship Pier situated 4.8 miles from the hotel. Clearly, the Hyatt Ziva Puerto Vallarta has a lot to offer to both travelers seeking luxurious relaxation and posh pampering, as well as more active adventurous types seeking an elegant, all-inclusive and varied vacation experience. Couples seeking romance and families with kids looking for a fun beach escape are equally welcome and taken care of via unique and exclusive amenities and activities. You can also book the Hyatt Ziva Puerto Vallarta for a dream destination wedding in a gazebo on the beach, in the ocean-view penthouse overlooking the ocean, or inside the royally decorated ballroom. Additional amenities at the property include entertainment staff, business meeting facilities, and a tour desk. But most people come for the all-inclusive pampering, from the fantastic and plentiful dining options to the lovely spa and all-around vacation fun with gorgeous ocean views, fragrant sea breezes and welcoming staff in an elegantly modern ambiance. Best of all, with an all-inclusive property, you can truly leave all of your worries and responsibilities at home. There's no need to even plan your day, since you can eat and imbibe anytime, and activities await pretty much 24 hours a day, even for the wee ones. So you can opt to stay on the manicured premises and relax, or be as active as you desire --- or book one of the many local adventures to get a taste of local culture and history.